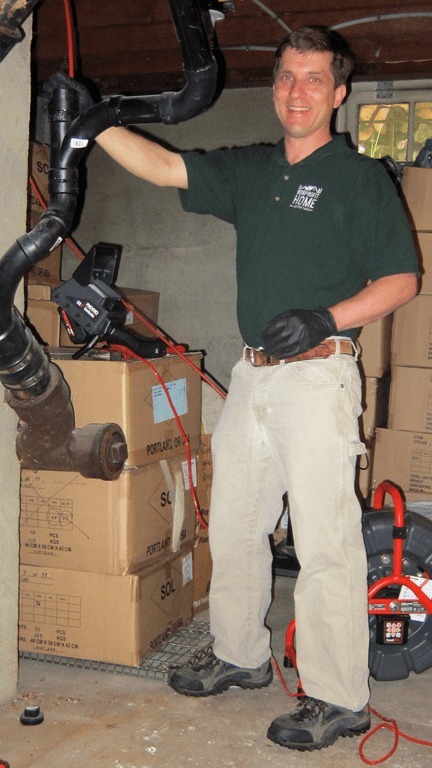 Nonprofit Home Inspections offers sewer scopes and sewer inspections in Portland, Vancouver, Eugene, Springfield, Beaverton, Tigard, Clackamas, Happy Valley and surrounding communities. O btaining a sewer scope or sewer inspection in Portland by a licensed plumbing inspector can be one of the most cost effective ways to prevent unnecessary future expenses for a new home owner. The simple fact is that sewer lines break over time, so it’s best to figure out if your new home has a problem with its sewer line before you close your real estate transaction. Repairing a sewer line in Portland can cost up to $20,000 or more, so it’s critical to get a sewer scope or sewer inspection in Portland before closing on your purchase agreement. If there is a problem, you can negotiate with the seller for replacement costs before it becomes solely your problem. Sellers of a property may not even know that they have a problem, so it behooves you to do your own due diligence by having your own sewer inspection done by an unbiased third party like Nonprofit Home Inspections. Nonprofit Home Inspections is uniquely qualified to give you the most unbiased inspection of your sewer line in Portland. To begin with, as a nonprofit 501(c)(3) organization, we’re not in it for the money. Our only goal is to help you make the most informed decisions possible for the safety and protection of your family. We don’t have any onerous franchise requirements or a for-profit mentality that would cause our inspectors to give you anything but the straight and honest truth. In addition, we believe that there is a conflict of interest when sewer line inspectors also offer to repair the problems they might find. Purchasing a new home can be extremely stressful and worrisome. While many plumbing contractors are honest, there are also those who take advantage of unsuspecting homeowners by pushing unnecessary pipe repairs during an already stressful time. Because of the obvious conflict of interest in both finding and then immediately offering to fix very expensive problems in your home, we only provide inspection services and do not bid on fixing any problems that we might discover. We will, however, be happy to provide you a list of contractors should your sewer line need repair. As with any of our services, we will never receive a kick back or referral fee for giving referrals. To help you make an informed decision about getting a sewer scope or sewer inspection in Portland, please find below a number of frequently asked questions concerning our services. After getting up to speed on important distinctions about our services, feel free to give us a call or send us an email to schedule your Portland sewer scope today! What Are Some Of The Problems Normally Found With A Sewer Scope in Portland? There are a number of different problems that can plague underground sewer pipes in Portland. To begin with, metal pipes can be damaged over time by corrosion or rust. The interior of the pipes will corrode overtime and flake off large pieces of metal. Eventually, this corrosion will lead to holes in the pipe that will invite blockage and additional damage from roots. Concrete pipes can also suffer from a different type of corrosion, but this results in what is called “exposed aggregate” where the rocks and pebbles that help make up the concrete are visible during our sewer scope. Because water travels on the bottom of the pipes, most of the exposed aggregate will be found on the bottom of the pipes. Exposed aggregate is a sign that concrete pipes are beginning to fail and may need repair or replacement in the near future. Another common sewer pipe problem is caused by root intrusion. Roots will travel an amazingly far distance in search of moisture. Small cracks, leaks, or failing joints in a sewer pipe will invite roots that are in search of water and the nutrient rich waste that passes through your sewer line. Left unchecked, roots will continue to grow causing more damage to the pipes and sewer line blockages. Additional common problems include “bellied pipes” where water collects in pools, punctured pipes (possibly from nearby construction), pipe that has improperly been narrowed from a larger size down to a smaller size pipe, and misaligned pipe where joints are not level. Misaligned pipes don’t always need replacement if they are “in your favor”, meaning that the pipe farther downstream is slightly lower than the upstream pipe. Misaligned pipe where the downstream pipe is higher than the upstream pipe, however, can lead to blockages and problems. How Long Does It Take To Inspect A Home’s Main Sewer Pipe In Portland? 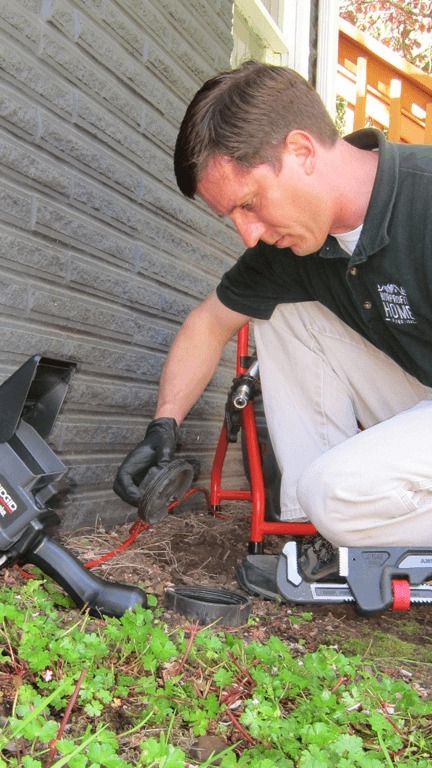 We are generally able to complete a full sewer line inspection within 30 minutes. If there is not an accessible cleanout and we have to push our scope through the main vent pipe on the roof, it may take longer. 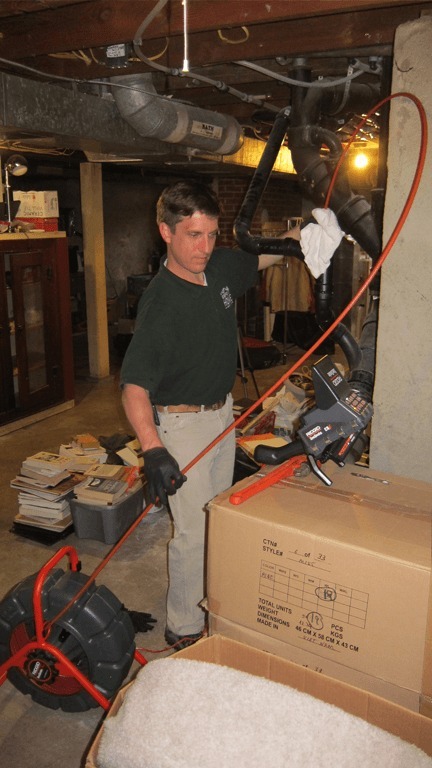 How Much Do You Charge for A Sewer Scope In Portland? We charge $150 for a complete sewer scope in Portland and surrounding communities if there is an accessible clean out available. This fee includes a video of the sewer scope that documents the condition of the sewer line. If we have to remove and reinstall a toilet, it’s a more involved process and we have to charge an additional fee. How Does Your Pricing Compare To Other Sewer Scopes In Portland? Our pricing is equivalent to many sewer inspection companies in Portland. 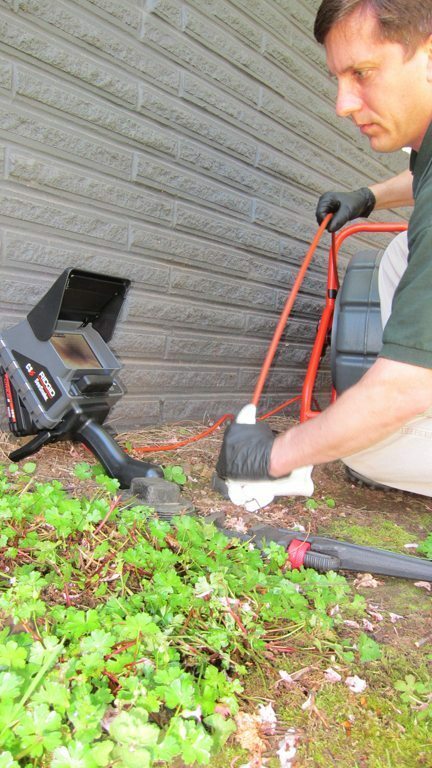 You will find some that offer $99 sewer scopes, but watch out. Companies that offer cut rate sewer scopes in Portland frankly do not cover their costs with sewer line inspections, they make their money replacing and repairing sewer lines. The Oregonian highlighted some companies that used high pressure sales tactics to push expensive and sometimes unnecessary sewer pipe repairs. Don’t fall for high pressure sales tactics just because you got a cheap sewer scope – get a completely unbiased sewer line inspection with Nonprofit Home Inspections. Some cut rate sewer inspection companies will also charge you extra if you want a video of the sewer line inspection. We’ll give you a video with every inspection we do whether there is a problem or not so you can see for yourself. Do Your Inspectors Get A Commission For Repairs? No. Unlike many plumbing companies that offer huge incentives to employees for finding and then selling sewer line replacements, our nonprofit inspectors have no financial incentive whatsoever for encouraging you to replace your sewer line. If there is a problem, we’ll let you know, but we’re not going to pressure you into replacing a perfectly functioning sewer line just so we can make more money. Most sewer line problems are pretty easy to identify and you’ll be able to use the video we provide you with to see for yourself the extent of any problem. With our video in hand, you’ll also be able to quickly get multiple bids from competing contractors if your pipe does need repair or replacement. Where Can I Find Out More Information About My Sewer Line? If you live in the City of Portland, you might be able to find some records online at PortlandMaps.com. Be sure to check out the “historic permits” section on the top right hand side to download scans of older plumbing permits. Although the database isn’t comprehensive, you might also be able to find out if your property ever had a underground oil tank. What Are My Options If The Sewer Line Does Need Replacement? Fortunately, there are a number of options for sewer line repair and replacement in Oregon. It used to be that the only option for replacing a sewer line was to dig it up and install a new one. This “traditional” option destroyed carefully crafted landscaping, sidewalks and driveways. With improved technology, however, sewer lines can now be entirely replaced or repaired with what’s called “trenchless sewer replacement” through a couple of different techniques (pipe bursting, slip lining, or relining methods). With the pipe bursting method, a wedge is pulled through the old pipe, breaking it up and making way for a new sewer line that is being pulled in right behind the wedge. Slip lining involves the installation of an entirely new sewer line inside the old line, while relining involves installation of a new liner and epoxy resin to the inside of the old pipe. Both slip lining and relining reduce the overall diameter of the old pipe. What Are Different Kinds Of Pipe Frequently Used For Sewer Pipes in Portland? The most common types of materials for sewer pipes in Portland include cast iron, clay, steel, concrete and ABS plastic. Orangeburg pipe (essentially tar paper piping) was used prior to the 1970s and may still be in use in some homes today. Orangeburg pipe is a light weight plumbing pipe that was made from compressed wood fibers and pitch (essentially tar paper). It was widely used prior to the 1970s when most localities restricted its further use in residential plumbing applications. Plumbers liked it as an alternative to cast iron pipes because it was a light weight and could easily be cut with a hand saw. While the pipe was projected to last 50 years or more under ideal conditions, it frequently failed in as few as 10 years or less. Unfortunately, if you have Orangeburg or “bituminous fiber pipe”, you will likely need sewer repairs in the near future. What Kind of Experience Do Your Inspectors Have? 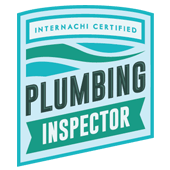 Our sewer line inspectors have earned plumbing certifications through the International Association of Certified Home Inspectors. Unlike many plumbing inspectors, our employees are also licensed home inspectors with construction experience. Our inspectors are able to use their comprehensive construction experience to give you a holistic understanding of your home’s plumbing without attempting to push unnecessary expensive repairs. What is the Best Way to Get A Bid For Sewer Line Replacement or Repair? Selecting an unbiased third party sewer line inspector like Nonprofit Home Inspections is the best first step in getting a sewer line replacement. Once you have our report and video in hand, you can quickly obtain multiple bids from competing contractors. Estimates can vary wildly, so it’s important to get multiple bids from licensed contractors with good reputations in the community. Check online reviews from previous customers and make sure they are properly licensed, bonded and insured with the State of Oregon’s Construction Contractor’s Board (CCB). What Should Be Included In A Sewer Line Replacement Bid? When moving forward with a sewer line repair or replacement, you should request a detailed bid, not just an estimate, from licensed contractors. This bid should explain exactly what work will be done, what materials will be used, who will be responsible for taking out and paying for required permits, what the total project cost will be, and a proposed timeline. This bid should also detail out what condition the property will be left in at the end of the project (i.e. will the contractor restore any damage to the lawn, shrubs, trees, sidewalk, driveway, etc.). Be cautious when dealing with contractors who insist on estimates only as costs may increase dramatically once the project has started and you are now fully committed to the effort. Researching companies online and with the Better Business Bureau can help you identify unscrupulous contractors that you should avoid. What Is The Best Way to Research Sewer Line Contractors In Oregon? To begin with, you should make sure that anyone offering to work on your sewer line in Oregon is properly licensed, bonded and insured. In Oregon, a contractor’s licensing, bonding and insurance information can be found online at http://search.ccb.state.or.us/search/. Results from this search can also tell you if a contractor has had any previous complaints or administrative actions from the CCB. Online reviews from Yelp, Angie’s List, Google+ and others can also help you make more informed decisions. With Yelp, make sure to click on “reviews not recommended” to get a bigger picture (both good and bad) of the company’s history with consumers. While Yelp says that they don’t hide bad reviews because companies advertise with them, you should check out hidden bad reviews and judge for yourself if you want to do business with a particular contractor. In addition, look for reviews that were removed for violating Yelp’s terms of service (i.e. posting fake reviews about your own company, etc.). You may want to take a second look at a contractor that has had several reviews removed for violating Yelp’s terms of service since they may have attempted to manipulate their own reviews.